Don't let abortion laws kill any more women. This week, the first American study ever to look at what happens to women when they’re denied abortions was released. It’s a fascinating, but not all that surprising, read. The research shows women who seek out abortions and are unable to obtain them fare significantly worse over time than women who are able to procure the procedure. Women who are denied abortions are more likely to end up on welfare, more likely to stay in abusive relationships, and more likely to be emotionally distressed over their pregnancy outcome. Women’s lives suffer when they are forced to carry pregnancies. I thought I was angry when I read this research. But then I heard about Savita Halappanavar in Ireland, whose tragic story reminds us of the worst thing that can happen when women are denied abortions. The 31-year-old Indian dentist, who was seventeen weeks pregnant, went to the hospital with severe back pain. Within hours of being admitted, doctors told her she was miscarrying. The law in Ireland—which only allows for abortion if a woman’s life is in danger—prevented Savita from being able to end her pregnancy and her excruciating pain because there was still a fetal heartbeat present. Savita countered, “I am neither Irish nor Catholic.” Still, she was denied. That night she vomited repeatedly and collapsed in a restroom. The following day, the fetus’s heartbeat finally stopped and it was removed by the doctors. But it was too late. Savita was transferred to the ICU where she died of septic shock. Savita died in terrible pain, over the course of several days, begging for a medical procedure that would save her life. She was killed—murdered by a law that places women’s humanity beneath that of a fetus. American women would do well not to dismiss this as a tragedy that could only happen in another country. This is what happens when you legislate something as personal and complicated as pregnancy. How do doctors decide when a woman is close enough to dying to give her an abortion? Or to what degree does a woman’s health need to be at risk? I had a life-threatening pregnancy. I was lucky to be far enough into my pregnancy that I was able to deliver my daughter—had it been just a few weeks earlier, I would have been forced to end the pregnancy to save my life. I went into an emergency C-section with my blood pressure rapidly escalating and my liver failing. If there were a law trumping the rights of my fetus over my own, what would have been considered a reasonable risk for me to take? Undergoing a liver transplant? Having a few eclamptic seizures? It’s not just our lives and health that are in danger, but our human dignity. Consider the women in Ireland who suffered as Savita did but lived—put through needless torture in the name of “life.” Or the American women who are denied late-term abortions even when the fetus has no chance of survival—forced to carry dying babies. Or the women with doomed pregnancies who—thanks to draconian ultrasound laws—are made to listen to a nurse describe the organs and details of their dying fetus before being allowed to have an abortion. Where is the compassion—the basic human desire to end suffering and injustice? I’ve been thinking about why it is that Savita’s story has struck such a chord with so many, and why it’s impacted me. I hear awful stories about women every day, but it is Savita’s that has had me in tears since I first heard of it. It’s about her family, the needless suffering and death, and a life cut short. I think about how scared she must have been, how frustrated, how angry. But there’s something else—another reason why so many women are infuriated and despondent about Savita. Savita’s death is a reminder that no matter how far we think women have come, to some we are simply not people. Our lives are worth nothing, valuable only for our bodies and what they can provide men, the state and the culture. Most days—even when there are constant reminders of our second class status through policy or the media—I can put this feeling aside. But every once in a while there is a stark, horrifying reminder of what it means to be considered less than. There is no way to describe the pain of knowing that to so many—to your country, even—you are nothing. But we are not nothing. Savita was not nothing. She was a person and she was loved—as we all are. 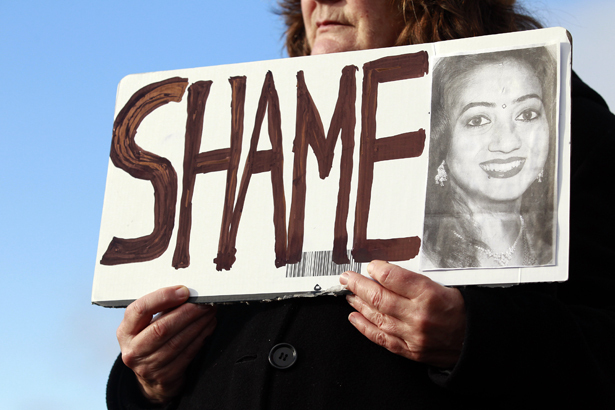 If we want to honor Savita we cannot stand by while others enshrine women’s dehumanization through policy. Demand justice for Savita. Join the women and men worldwide who are protesting, shaming those who would ensure more tragedy, heartache and needless death in the name of ideology and religion. Let them know this cannot, this will not, happen again.